After the morning service on Sunday 16th December 2018, members adjourned to the large hall for a shared Christmas lunch, lovingly prepared by Angela and Shona and thoroughly enjoyed by all! You are invited to join us in our celebrations on Christmas Eve in St. Cuthbert’s Church in Saltcoats. Bring your family! Bring a friend! At 7:00 pm there will be a joyful Family Service and then at 11:30 pm our Watchnight Service when we remember the birth of our Lord Jesus. 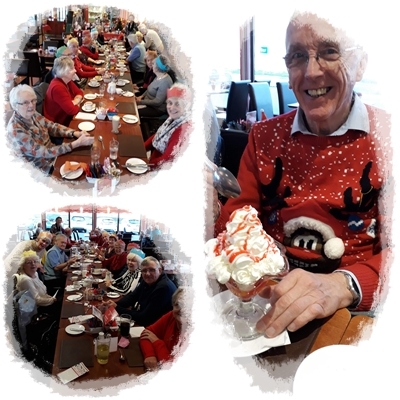 The Monday Club and some friends came together at the Rowan Tree in Ardrossan on Monday 10th December. 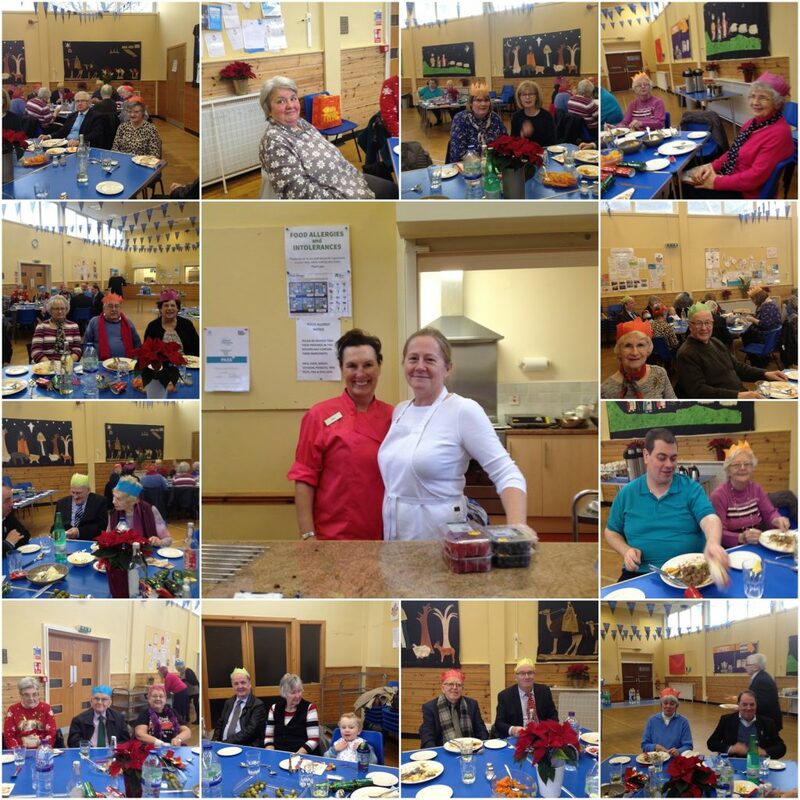 Plenty of chatter, good food and a joyful end by singing a couple of Christmas songs – to the delight of other diners! On Wednesday 5th December Saltcoats St Cuthbert’s Guild welcomed Guilds from across North Ayrshire (Guilds Together North Ayrshire) came together for a Christingle Advent Service. We were also joined by some 30 children from the Caledonia Primary School. We sang both traditional and more modern carols, listened to readings but also were enchanted by the children’s offering of two songs and a poem. The poem can be viewed HERE. If you have never heard of Christingle before, you are not alone. Mrs Jean Hunter gave a small presentation explaining the significance of this tradition. Christingles are made from an orange decorated with red tape, sweets and a candle (in our case a glowstick for safety reasons). The lit candle represents Jesus’ light in the world, bringing hope to people living in darkness. The December magazine is available to view on the Magazine Page. Next Sunday is the Sunday School’s Gift Service when the boys and girls will donate a new toy or gift to children in the community who otherwise may have a poor Christmas. Please support our Sunday School by donating a gift of your own. Ena and William’s Choir Concert is this Saturday the 8th December in the Grand Hall, Kilmarnock. Please see either of them if you wish a ticket. 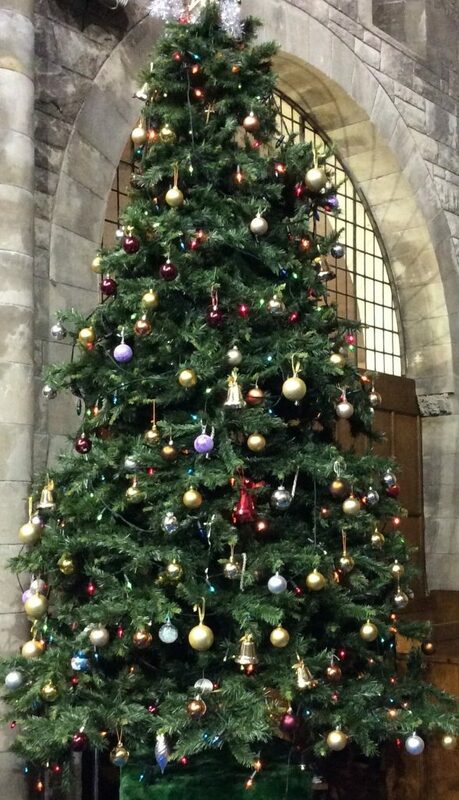 Please add your name to the list on the church notice-board at the end of the link corridor if you wish to attend the Congregational Christmas Lunch on Sunday 16th December provided by Angela, Shona and the team. Sarah has ordered cards of invitation to Christmas services to be distributed to the parish and she needs a band of brothers and sisters to deliver these cards door to door. Names to Elsa please or to the list at the end of the link corridor. Angela is asking for volunteers for The Community Café. This is a wonderful asset to the church and to the community but it needs more help as it grows busier.